Summary: What good is the law if violation of the European Patent Convention (EPC) is so routine at today’s European Patent Office (EPO), which exploits its immunity to operate outside the rule of law and pursue nothing but cash (selling patents/monopolies that are invalid in courts)? OUR next post will deal with the U.S. Patent and Trademark Office (USPTO) under Iancu following the 'Battistelli model', i.e. attacking/ignoring judges. But before we get to that, shall we take a look at the latest EPO madness? We shall. First of all, there are overt violations of the EPC when the EPO grants patents on life. Those were never meant to be granted or even considered for a grant. Miraculously enough, however, nature and life are now regarded as “inventions” (whose?) and Kilburn & Strode LLP’s Nick Bassil has just published this piece about the EPC allowing patents on "essentially biological process". What has the patent world sunk to? Notice that a legal battle was needed here. A government needed to spend a lot of money in court to show that the EPO was out of touch. How many people are able to do this? Also, is this good use of the limited budget of Ethiopia? This, basically, is the outcome of gross violation of the EPC. This is what the EPO does to its reputation worldwide, including in Africa. Well, it’s “a must” for Kluwer (the employer) because at a rate of £86.00 for just one copy, it would be paying Kluwer quite a lot of money. 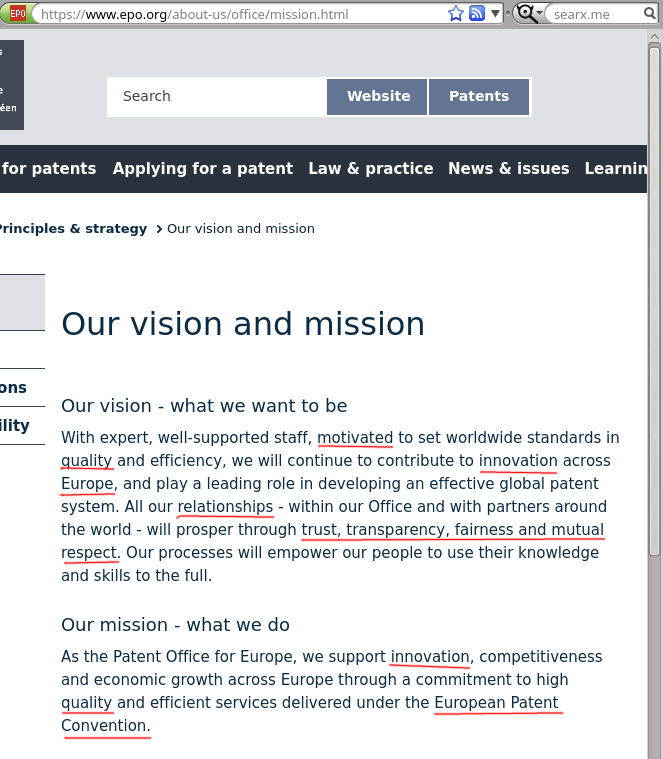 Kluwer Patent Blog isn’t always ads and lobbying (e.g. for the UPC). Thorsten Bausch, for a fact, is the exception. He has a sobering bunch of views on the UPC and the EPO and he has just published this blog post regarding an important ethical aspect of European Patents (EPs). As we recently explained, some wrong EPs can end up killing women with breast cancer (monopoly pricing) and these EPs are sometimes granted in violation of the EPC (judges lacking independence means it will slip through them anyway; can they oppose patent maximalism when they’re controlled by bankers and politicians like António Campinos and his master?). Two members of the formulation patent family stand out: EP 1 250 138 and its divisional EP 2 266 573. Both patents refer to a specific formulation of the antiestrogen drug fulvestrant and its use in the treatment of breast cancer via intramuscular injection. The ‘138 patent was granted based on claims directed to the formulation as such. A subsequently filed opposition was rejected and the patent maintained as granted. On appeal, however, a third party introduced a new reference (“McLeskey”) that was said to disclose a formulation falling under the claims of EP’138 and thus appeared to be highly relevant in regard to these claims. However, this formulation was only used in the quite different context of an exploratory mechanistic study looking at a different (estrogen-independent) type of breast cancer, against which this formulation showed no efficacy even at extremely high doses, when given to transfected mice via weekly subcutaneous injections. McLeskey also contained no data about the physical properties of the formulation, its pharmacokinetics and, in particular, its safety, its efficacy against estrogen-dependent breast cancer and the duration of its effect. Following the introduction of “McLeskey”, the Board of Appeal remitted the case back to the first instance where AstraZeneca amended the claims of EP‘138 into “formulation for use” claims, arguing that the use of McLeskey’s formulation for the treatment of breast cancer was neither disclosed in McLeskey nor obvious therefrom. The Opposition Division agreed and maintained EP‘138 in the thus-amended form. As the sole opposition had been withdrawn before the OD’s decision and no appeal was filed, this decision became final. But the story continues. AstraZeneca appealed the first instance EPO decision relating to EP’573, and oral proceedings took place before the Technical Board of Appeal 3.3.01 on 23.1. and 24.1.2019. These proceedings ended with a significant success for AstraZeneca: The Board of Appeal ruled that the decision by the opposition division is set aside and that the oppositions are rejected. That is, the EP‘573 patent was maintained as granted. Whose interests are served by today’s EPO? Remember that these boards’ lack of independence is, in its own right, a violation of the EPC. The granting authority seems to be in charge of everything, even justice itself. It’s like putting the “executive” in charge of “legislature”. The European Patent Office has signed a bilateral cooperation agreement with the Licensing Executives Society International (LESI). The agreement was signed by EPO president António Campinos and LESI president François Painchaud during LESI’s Winter Planning Meeting in Miami, Florida. The agreement is aimed at helping innovators make better use of the European patent system and will remain in effect for a period of five years. Campinos said the agreement “will help innovators see the business opportunities that IP can create”.